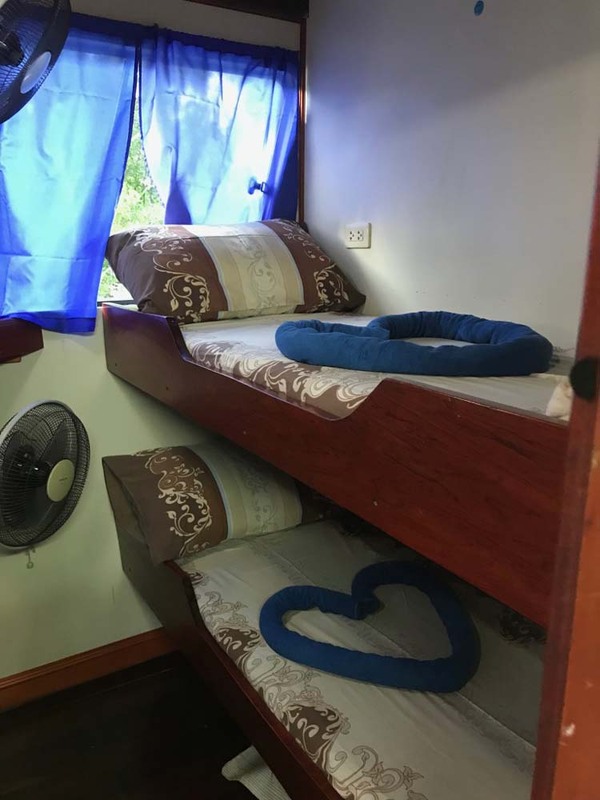 Miss Moon is a very special boat that has several unique features. 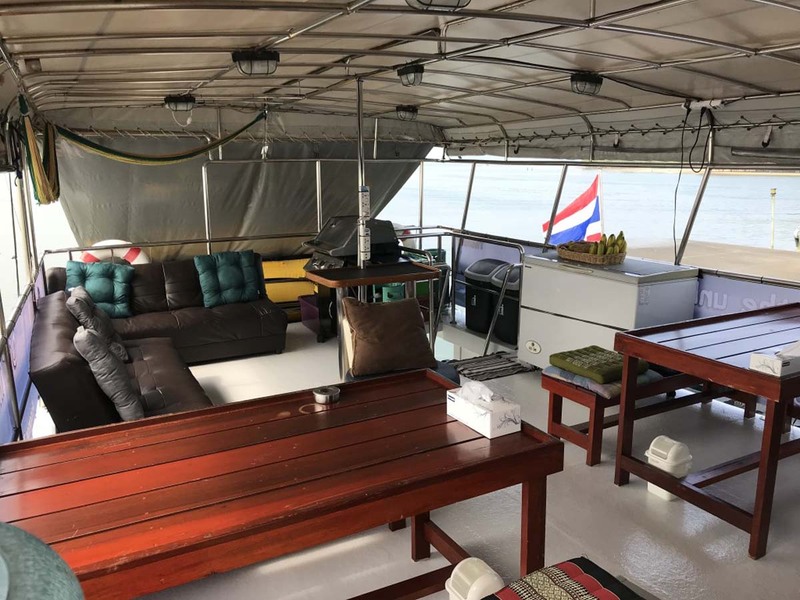 Built in 2008 and run by an experienced Danish & Thai team, the boat is 18 metres in length, but takes only ten guests on each trip. 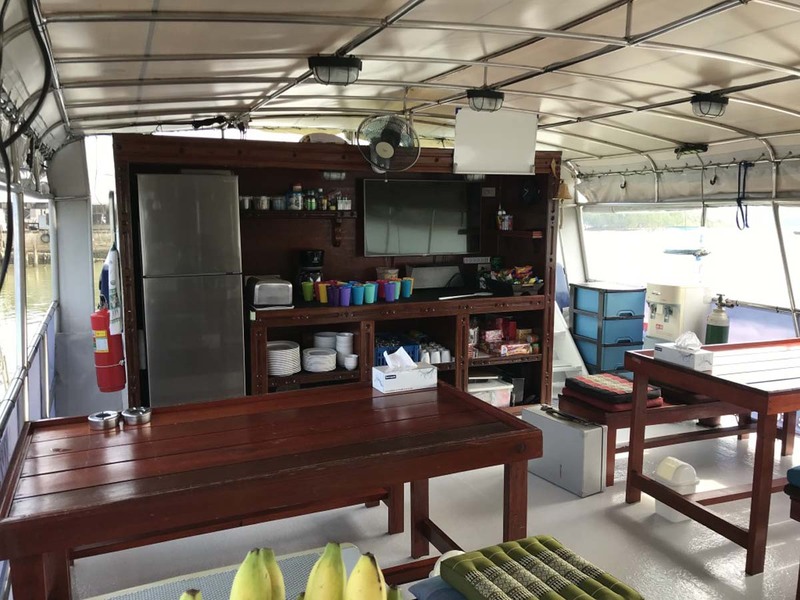 The atmosphere and service on board is friendly, with lots of delicious food and diving only at the best dive sites in Thailand. The trip prices also make it excellent value. 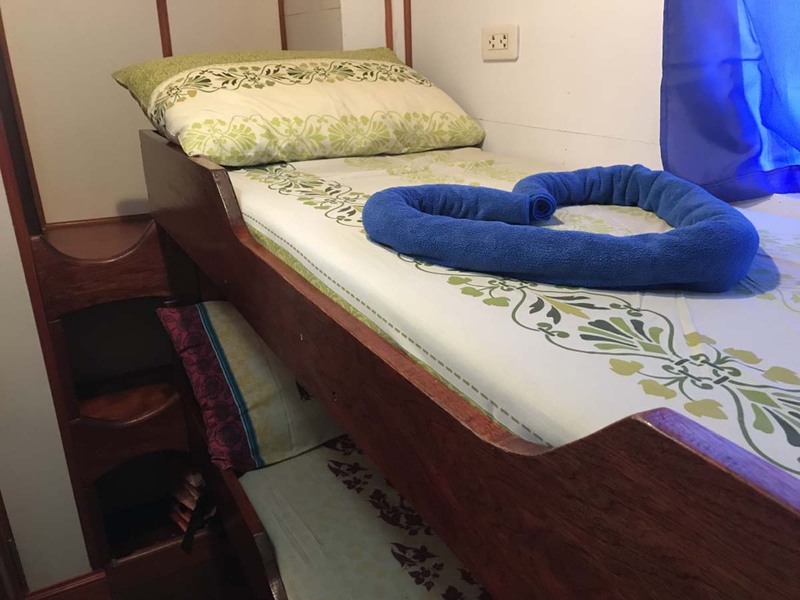 Several things make Miss Moon different from all the other Similan & Richelieu Rock liveaboard diving boats. Firstly, is its itinerary. Instead of sailing from Khao Lak, Miss Moon starts and ends its trips from the quiet seaside town of Ranong, on the border with Myanmar. 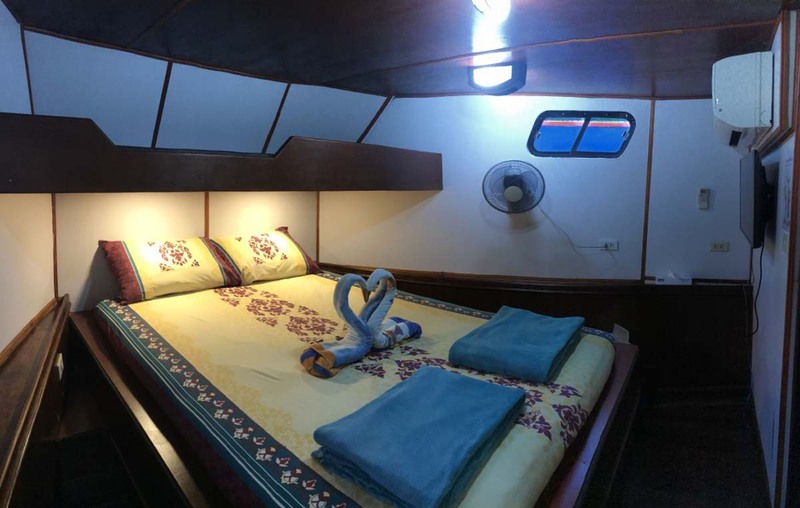 Also, guests who want to start or end their trip on the island of Koh Phayam can do so. Miss Moon can pick divers up from there in the evening of departure day, or drop them off on the way back at the end of the trip. And because the port is further north, the boat sails to The Surin Islands instead of the Similans. The Surin Islands have better reefs, fewer day trip tourists, and there’s a Sea Gypsy village which Miss Moon visits. 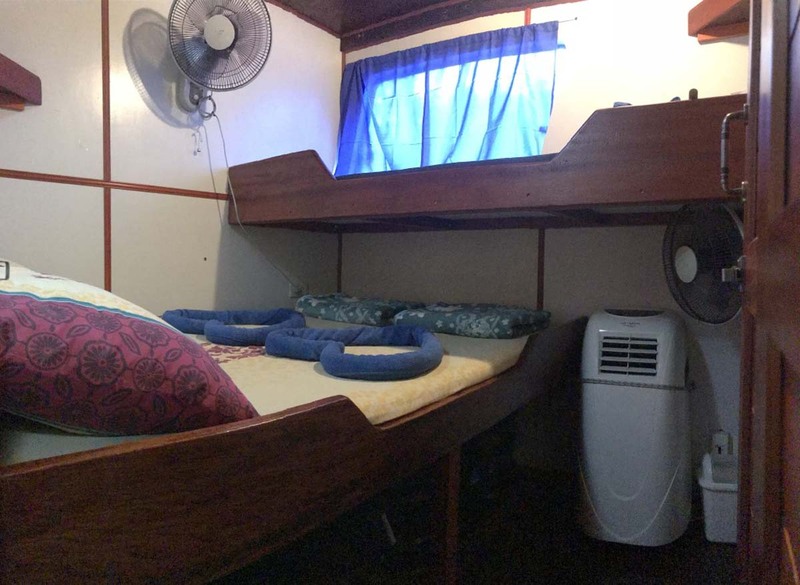 Also, although Miss Moon is not as big as many other diving liveaboards in Thailand, only ten guests join each trip. That means a much more personal service and friendly feel on board. 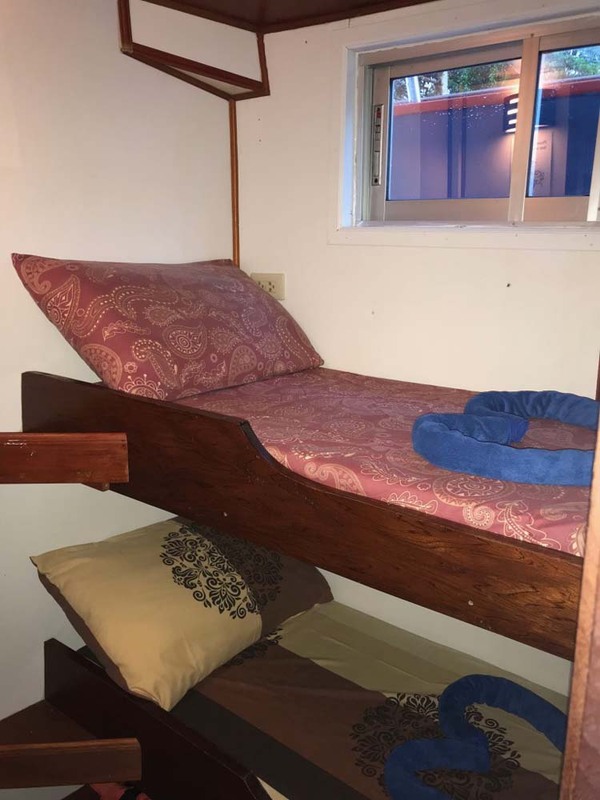 There are five guest cabins on the boat: three with twin bunk beds, one with a double bed, and at the front of the boat the master cabin has a double bed, a flat-screen tv and a private bathroom. The standard cabins share communal bathrooms, which are located nearby. 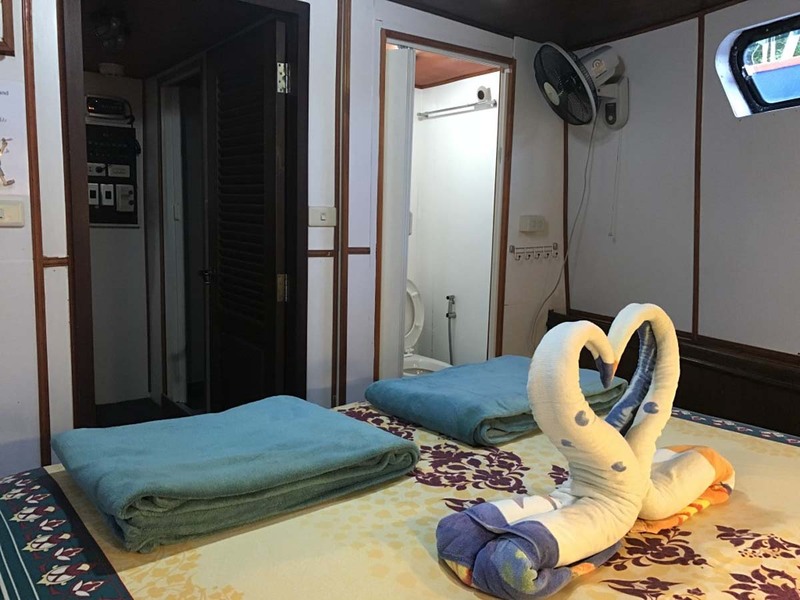 All guest cabins are on the boat’s main deck, which is also where the kitchen is. And the food on Miss Moon is a delicious blend of Asian & Western cuisine served buffet style several times per day. If you are a vegetarian, vegan or have other dietary needs, just let the team know in advance. No one will go hungry on Miss Moon’s diving cruises. 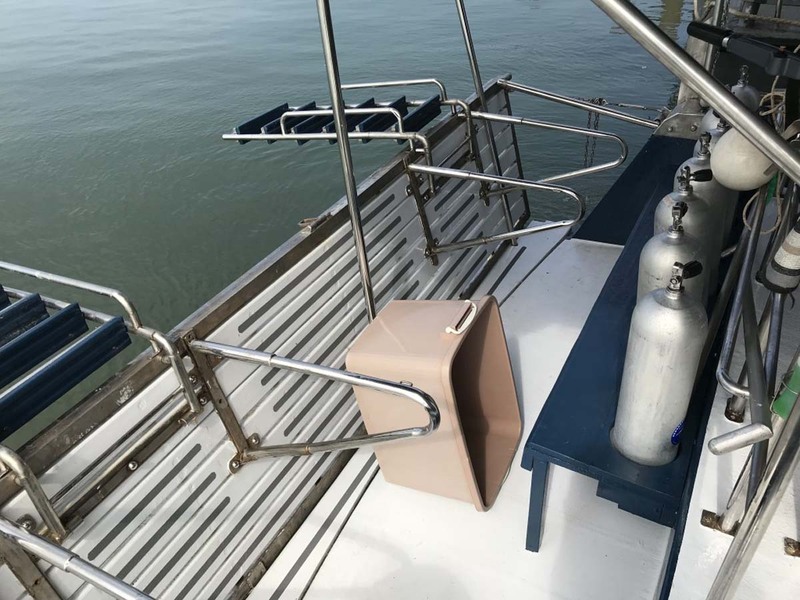 At the rear of the main deck is the diving platform that is easily big enough for the amount divers on each trip. 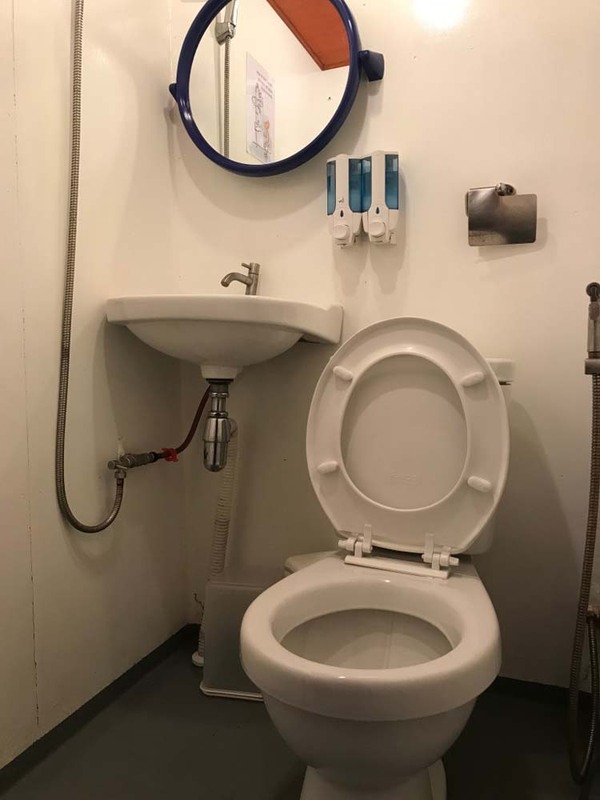 The boat was purpose built and well designed. 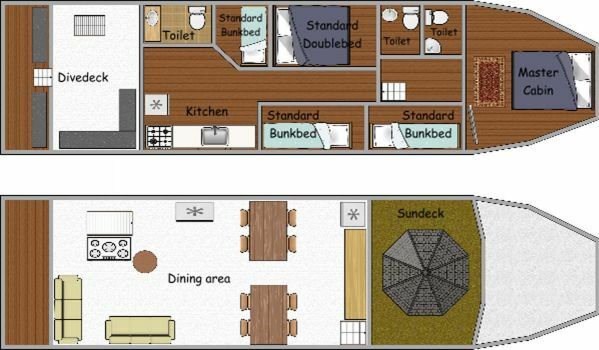 On the upper deck are the communal areas for socialising. 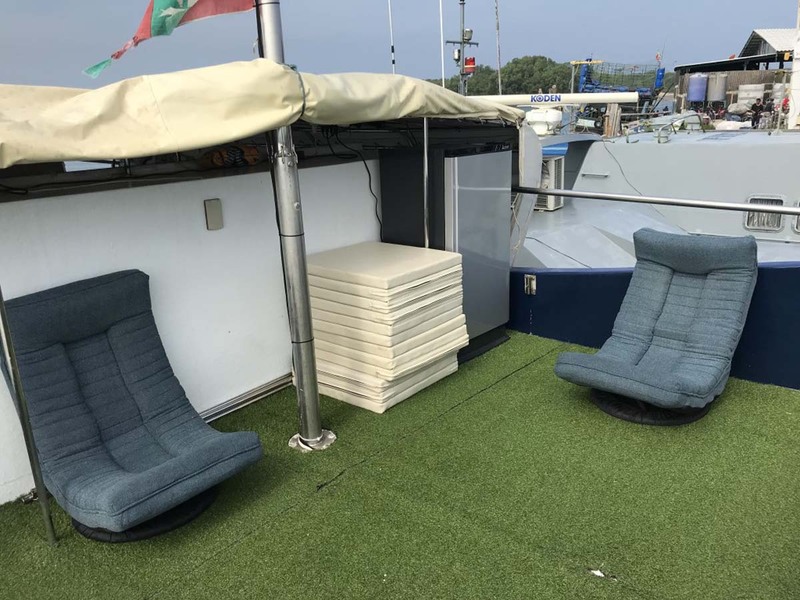 Here you will find a sofa area, dining tables, a tv, serving bar and a unique sundeck. The sundeck has fake grass and a refrigerator, meaning that you don’t have to walk to get the next cold drink! 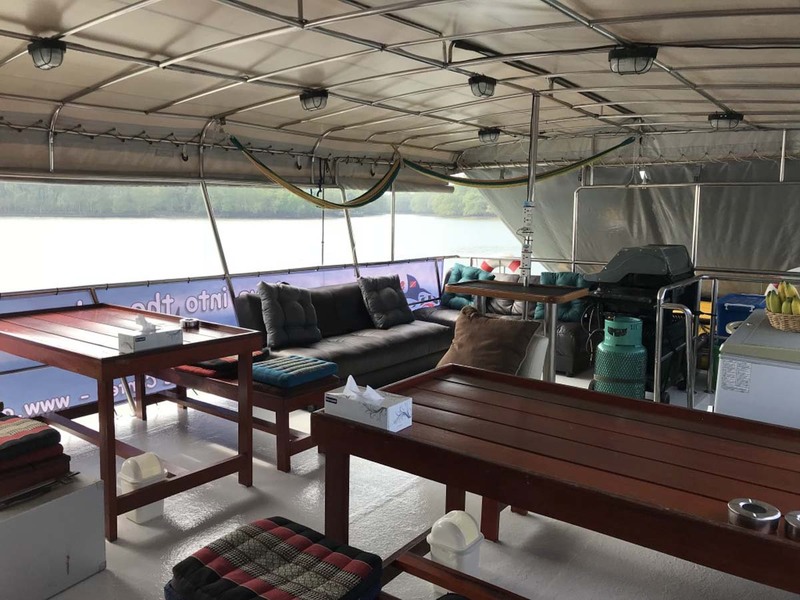 Dive briefings, meals, and evening drinks are enjoyed on the upper deck. 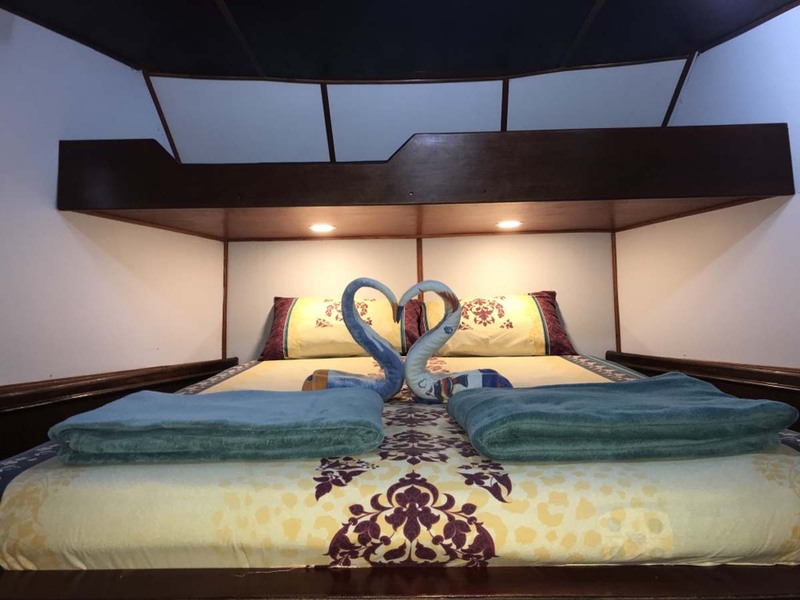 The crew and dive staff are experienced and service minded. Most of them have worked in this area for many years and they know the best times to visit the best (and some secret) dive sites. And finally, the Danish owner of the boat is the tour leader and he joins almost every trip, ensuring that everyone is happy throughout each cruise. Miss Moon’s itinerary for trips in Thailand begins in Ranong. Guests need to arrive at the dive centre before 1.00pm to sign some paperwork and maybe fit dive equipment. 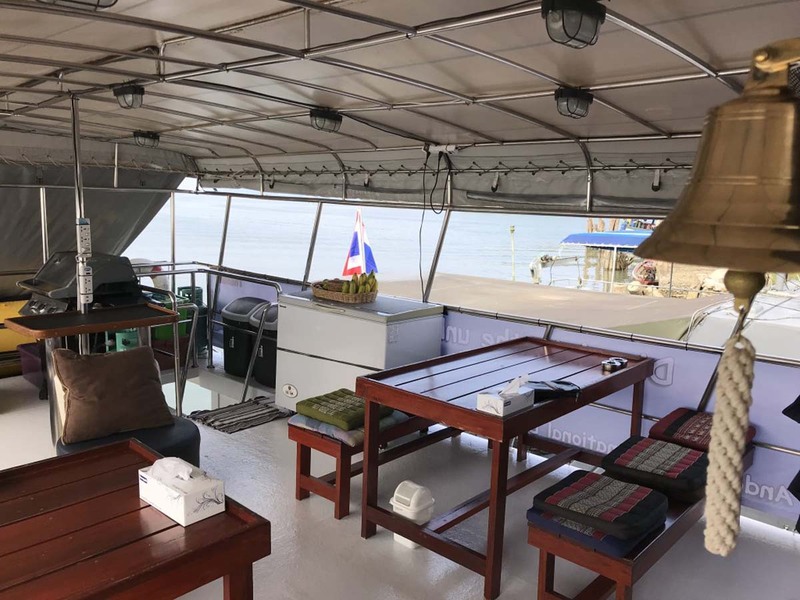 The boat departs from Ranong pier in the afternoon. Guests who are staying on Koh Phayam can be picked up there, and don’t need to come to the mainland. The diving starts the following morning at Koh Surin, with a visit to the Sea Gypsies’ village. 4 dives. The second day is spent at Koh Bon & Koh Tachai. 4 dives. 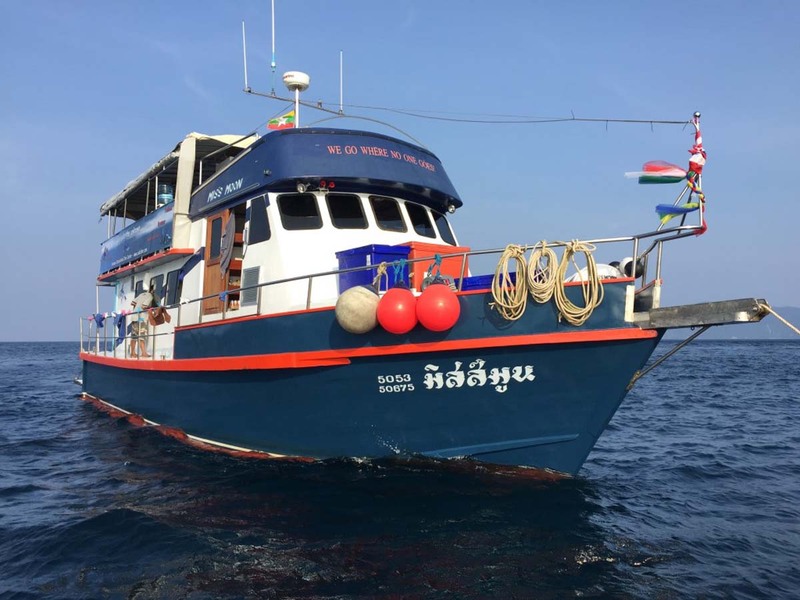 The final day is at Richelieu Rock (3 dives) and then the boat returns to Ranong in the evening. You can disembark at Koh Phayam on the way back if you choose. Engines: EK 320 HP Hino. 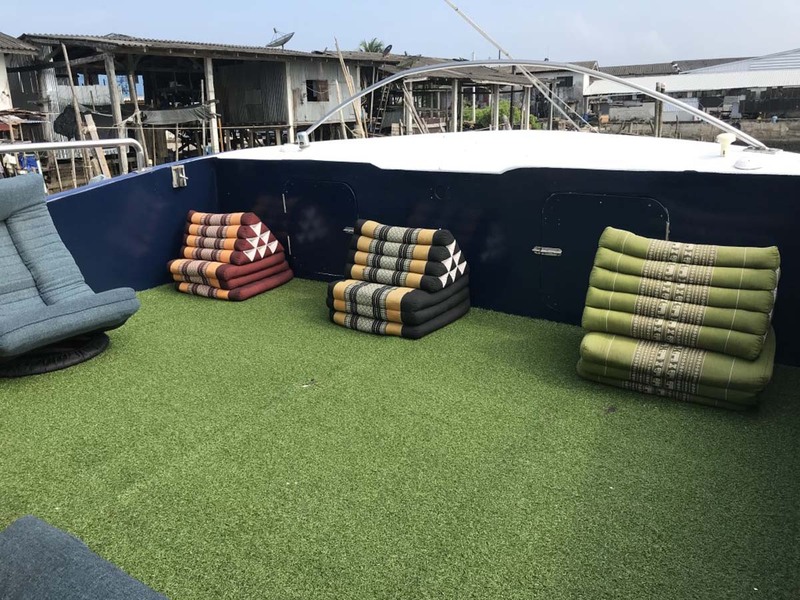 Sundeck: Sundeck With Artifical Grass (Shaded). Safety: Emergency Rafts, First Aid Kits, Life Vests, Fire Alarms, Oxygen, Satellite Phone, EPIRB And AIS. 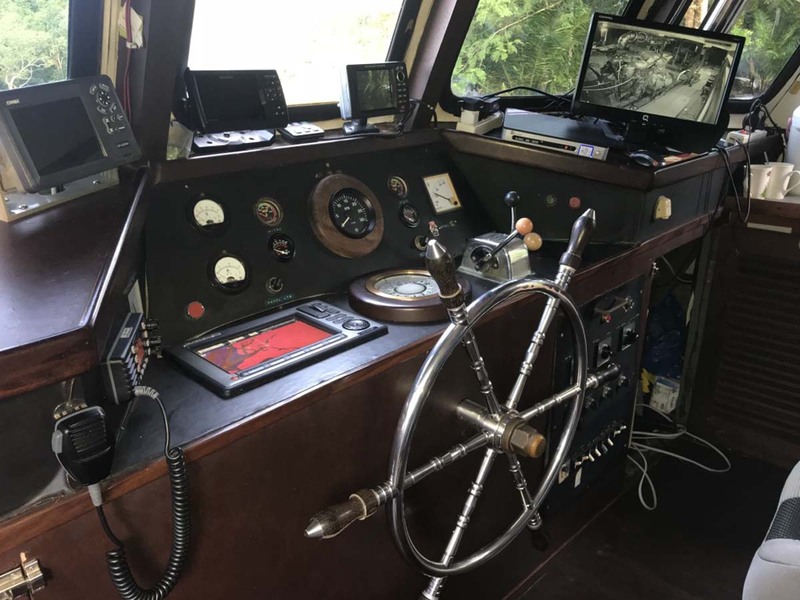 Navigation: Radar 40 NM, Chart Plotter, Radio VHF/SSB, Depth Sounder. Normally, Miss Moon guests make their own way to the dive centre in Ranong Town, or get picked up from Koh Phayam. If you would like to be picked up from the airport or a local hotel, this can be arranged.